How To Compare Website Traffic For Free! 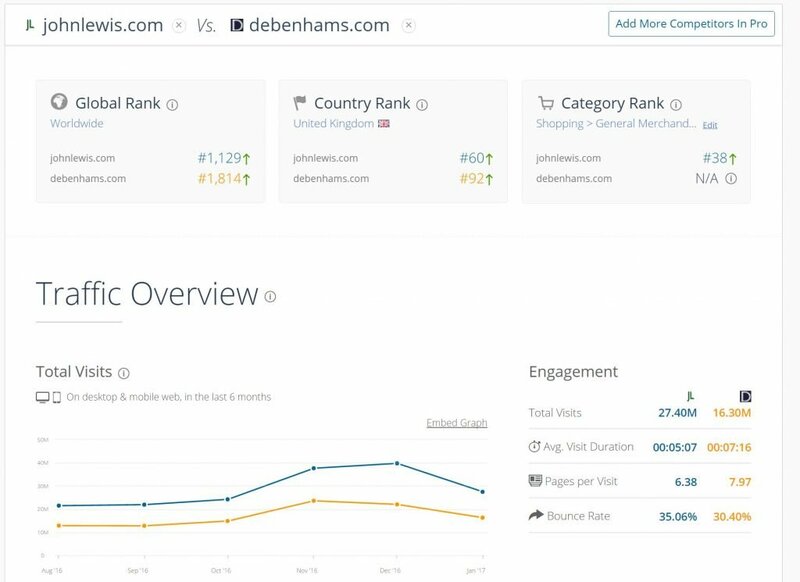 Competitor analysis can be a time consuming process to do well, but if you can compare website traffic of similar sites this can can provide valuable insights to inform decisions about marketing strategy, conversion rate optimisation, new market entry, product launches and content marketing approaches. If you can track competitors’ website traffic you can develop more effective strategies to deal with their threat to your business and improve your conversion rate. Website audience analysis tools allow you to check and compare website traffic volumes, source of traffic, average time per visit, bounce rate, pages per visit, search terms and more. Website competitors’ checker tools obtain this information by aggregating ISP data and or using panel data to give you easy access to up-to-date information on a sector or competitor. This allows you to track and compare website traffic for competitors, benchmark your performance, get an understanding of market size, collect geo and demographic data, monitor the search and content strategies of your competitors, and look at audience segmentation. Tools that allow you to compare website traffic are ideal for when you are drafting a business case, reviewing your marketing strategy, conducting a SWOT analysis or just need to track competitor website traffic. Below we I have summarised 10 leading website audience analysis tools for you to use to monitor competitor website traffic. 1.AdClarity: This is a leading social media and website audience analysis tool for digital media business intelligence. It allows you to examine which campaigns, creatives and traffic sources are working most effectively for your competitors. If you want to identify which publishers your competitors advertise with, the creatives used and landing pages they are sending visitors to AdClarity can provide you with this information. 3. Ahrefs: Site Explorer is an excellent tool to monitor competitors’ monthly organic traffic and how it’s changed over the years. To drill down on the estimates, you can check see a country-by-country breakdown of traffic and how much of it each keyword brings. Besides, Ahrefs has a free backlink checker that you can also use to analyze traffic, yet from a different angle. 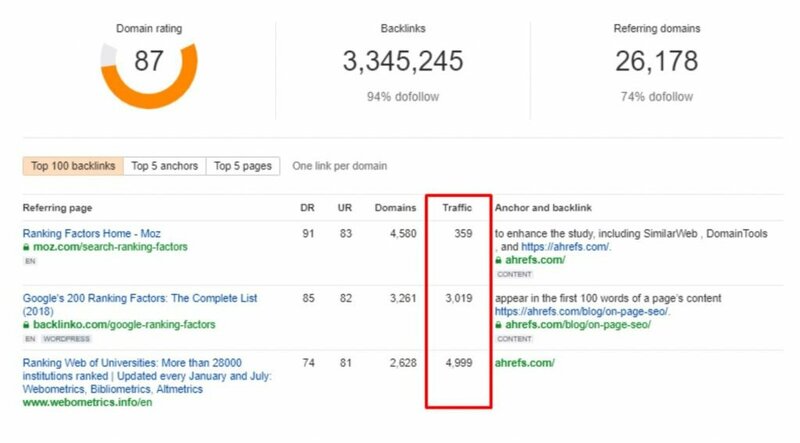 The tool lets you compare pages that link to competing domains by their traffic. Since these are the places where your competitors get most of the exposure, you may want to get mentioned there too. You can also check pages that link not only to the entire competing domain, but also to the specific page on it. It’ll come in handy if you have a similar or, better yet, much more useful article to force out your competitor and take their place. 3. Alexa: An enterprise website audience analysis tool to track competitor website traffic which allows you to monitor key web traffic metrics, top sites lists, site demographics and other data from websites with reasonable traffic volumes. The free service provides competitor data including traffic metrics, top sites in the sector and visitor demographics. The APIs can be integrated to allow you to validate your own analytics. A user friendly tool as it is part of Amazon and APIs can be integrated to allow you to validate your own analytics. It enables you to run comparison against competitor sites provided they get a reasonable amount of traffic. The free tool is very limited for smaller sites, but the subscription tool does provide a large variety of additional data from users who download one of the browser extensions. 4. Experian Hitwise: A subscription only website audience analysis tool for large organisations which provides benchmarking of websites with detailed visitor profiling so that you can understand user behaviour across multiple websites and devices. Its strength lies in the demographic data that it provides as a result of collaboration with ISPs and integration of visitor data. This allows you to track competitor website traffic in granular detail. 5. Google Analytics Benchmarking: This is free feature of Google Analytics that automatically benchmarks sites against at category level by channel, location and device. It is based upon data collected directly by Google Analytics across many websites within the specific category selected within your web analytics set up. The categories can be a bit generic and actual number of visits is not known. 6. Google Alerts:This is a free tool which can inform you every time a competitor or your company is mentioned online. 7. Quantcast Measure: This is a free website audience analysis tool with data for over 100,000,000 websites including detailed demographic, geographic and lifestyle data. Quantcast Measure offers behaviour across devices and platforms. As well tracking competitor website traffic you can obtain audience demographic and geographic profiles for your websites and mobile apps, plus for your competitors. This a great tool for getting information on the number of mobile apps users, visits and page views for a set period of time. Audience demographics are broken downy by gender, age, number of children, income, education, ethnicity, political affiliation and political engagement. In addition the tool can provide data on audience interests, other sites your audience visits and source of traffic. 8. 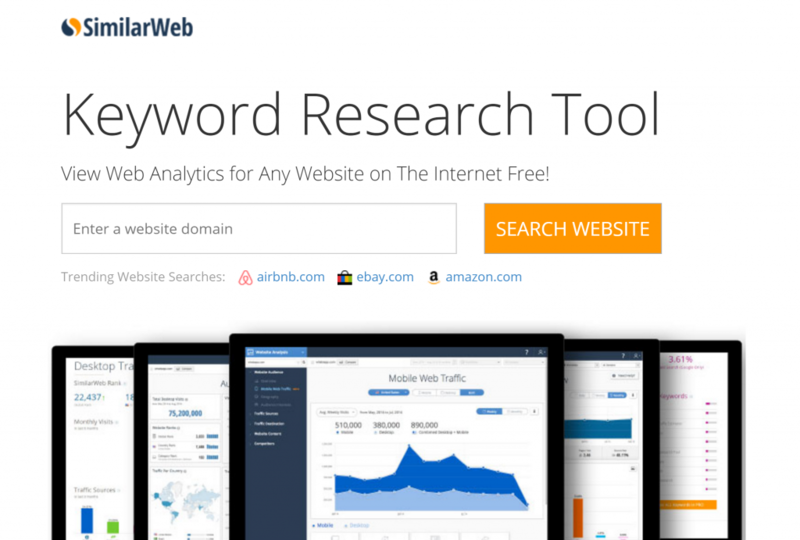 SimilarWeb: This is considered the best free website audience analysis tool as it shows website visits broken down by traffic source, keywords that your competitors are using and the number of mobile app users. The paid version provides organic and paid keywords, including not provided, evaluates most popular pages, benchmarks campaign strength and mobile app engagement. The data used by Similarweb is collected via browser toolbars and extensions and so like all these tools it is based upon a sample of users and its accuracy may vary according to specific category you are monitoring. However, it is one of the best tools to track competitor website traffic. 9. Siterankdata: A free website audience analysis tool that offers current and historical website rank data and analysis. You can compare top websites by keyword, domain extension or ranking changes. Works best for sites with a reasonable amount of traffic. 10. 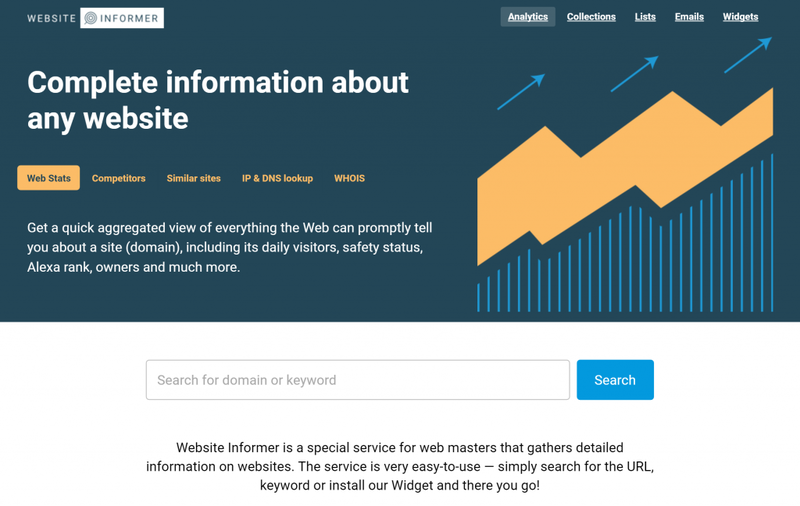 Website Informer:This is a free website audience analysis service for web masters which gathers detailed information on websites, general information, statistics, main competitors, similar sites, IPs and more. Competitor website audience analysis tools don’t have to cost the earth. Try out some of the free services, such as Similarweb to prove their value first. If your organisation is serious about website competitor intelligence and bench marking you can then migrate to a paid platform once you have found one that best meets your needs. There is no reason not to compare website traffic of your competitors. This will help you keeping abreast of how your competitors’ sites are performing. This is more important than ever as disruptive trends and brands usually steal market share from established brands.